�One night, the Russians sent a human wave of Mongols in a direct assault against our positions. Their function was to knock out the minefield, by crossing it. As the Russians preferred to economise on tanks, and as their human stockpile was enormous, they usually sent out men for jobs of this kind. The Soviet attack failed; the minefield exploded under the howling mob, and we sent out a curtain of yellow and white fire to obliterate anyone who had survived. The fragmented corpses froze very quickly sparing us the stench which would otherwise have polluted the air over a vast area. The Russians had not even used any of their artillery to help the Mongols, which seemed to confirm our estimate of the situation. We sent out patrols to try to remine the field, but the Russians were ready to fire on anything that moved. We were only able to put down a light sprinkling of mines, with regrettably heavy losses. It was clearly no longer possible to rely on mines to protect our front line. On another evening, when the cold had attained a dramatic intensity, the Russians attacked again. We were manning our positions in a temperature which had dropped to 45 degrees below zero. Some men fainted when the cold struck them, paralyzed before they even had a chance to scream. Survival seemed almost impossible. Our hands and faces were coated with engine grease, and when our worn gloves were pulled over this gluey mixture, every gesture became extremely difficult. Our tanks, whose engines would no longer start, swept the spaces in front of them with their long tubes, like elephants caught in a trap. The Mujiks preparing to attack us were suffering in the same way, freezing where they stood before there was time for even one "Ourrah pobieda" (Hurrah Victory!). The men on both sides, suffering a common martyrdom, were longing to call it quits. Metal broke with astonishing ease. The Soviet tanks advanced blindly in the light of flares, which intensified the bluish gliter of the scene. These tanks were destroyed by the mines which lay parallel to our trenches some thirty yards from our front line, or by our Tigers and Panthers, which fired without moving. The Russian troops, with frozen hands and feet, faltered and withdrew in confusion in the face of the fire we kept steady, despite our tortured hands. Their officers, who had hoped to find us paralysed by cold and incapable of defence, were unconcerned about the condition of their own troops. They were ready to make any sacrifice, so long as our lines were attacked. I managed to keep my hands from freezing by thrusting them, in their gloves, into two empty ammunition boxes, when the cartridges had run into the spandau. Our gunners, and everyone forced to use his hands, sooner or later turned up at the medical service with severe cases of freezing. There were many amputations. The intense cold lasted for three weeks, during which the Russians restricted themselves to sending over music calculated to make us homesick, and speeches inviting us to surrender. Toward the end of of January, the cold lessened somewhat, and became tolerable. At times during the day the thermometer rose as high as five degrees above zero. The nights were still murderous, but with frequent shifts of duty we managed to get through them. We knew that the Russian offensive would soon resume. One night, or rather one morning, toward four or five o�clock, blasts of the whistle sent us out once again to our interception posts. 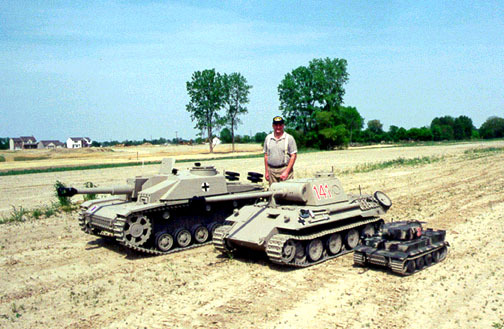 A mass of T-34 tanks were moving forward. An artillery bombardment had preceded them, inflicting heavy damge on Boporoeivska, and provoking a mass evacuation by the civilian population, which had been waiting for the fighting in terrified apprehension. 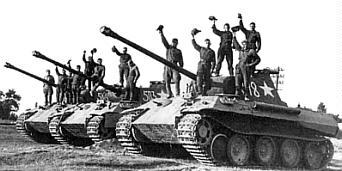 Our tanks - about fifteen Tigers, ten Panthers, and a dozen PzIIs and PzIIIs - had managed to start their engines, which had been heated continuously the day before. At the beginning of the offensive, two PzIIs had been destroyed sise by side in the Russian bombardment. The front was again threatening to give way. We lay in our trenches and waited for the hordes of Red infantry which were usually not long in coming. For the moment our machine guns and Panzerfausts were quiet, leaving the way clear for our heavy artillery and our tanks. Meantime the camouflaged Tigers and Panthers waited with their engines idling. Almost every time a Russian tank came into range, a sharp strident burst set it on fire. The Russians were moving toward us slowly, sure of themselves, firing at random. Their tactic of demoralization would have worked if there had not been so plumes of black smoke rising against the pale February sky. Our 37s and Panzerfausts, designed to be used at almost point-blank range, were scarcely called on. The first wave of Soviet armor was consumed five hundred yards from our first positions, nailed down by the concentrated fire of our Tigers and Panthers and heavy anti-tank guns. The Tiger was an astonishing fortress. Enemy fire seemed to have almost no effect on its shell, which, at the front was five and a half inches thick. Its only weakness was its relative immobility. A second Russian wave followed closely after the first, more dense than the first, and accompanied by a swarm of infantry which posed a serious threat. We waited, dry-mouthed, our guns jammed against our shoulders and our grenades in easy reach. Our hearts were pounding. Suddenly like a miracle, thirty of our planes flew over. As promised, the squadron from Vinnitsa was attacking. This particular job was easy for them, and every bomb hit home. A cry of "Sieg Heil, der Luftwaffe", rang so loudly from our trenches that the pilots might almost have heard it. We opened fire with everything we had, but the Russian offensive kept coming, despite overwhelming losses. Our tanks drove at the stricken enemy with an ardour worthy of 1941. The noise became unbearable. The air was thick with bitter fumes and smoke, and the smells of gunpowder and burned gasoline. Our shouts mingled with the shouts of the Russians, who were reeling under the unexpected resistance. We were able to watch the magnificent progress of our Tigers and Panthers, pulverizing the enemy tanks before they were able to complete a half-turn. The Luftwaffe attacked again with rockets and 20mm cannons. The Russian rout was hidden by a thick curtain of luminous smoke. The Russian artillery kept on firing at our lines, causing several deaths which we scarcely noticed. However, their guns were soon overrun by their own retreating troops, and fell silent. A second wave of German planes, an undreamed-of extra luxury, completed the Russian debacle. We hugged each other in excitement, bursting with joy. For a year now, we have been retreating before an enemy whose numerical superiority was constantly increasing. In our sector all the lines had held, and we felt very proud. We had proved once again that with adequate material and a certain minimum preparation we could hold off an enemy of greatly superior size, whose frenzied efforts were never intelligently employed. There were thirty Iron Crosses for us after this action �"
Vehicles which could not be recovered or repaired in situ, whose armament was still functioning, were sometimes used as pill-box strong points. 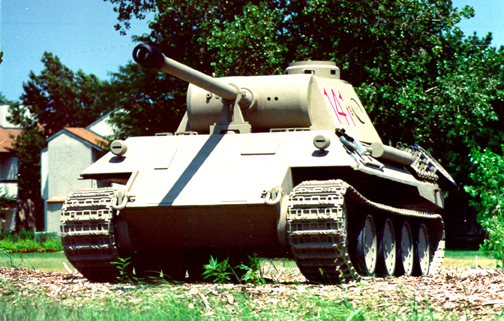 One such tank (Note: Presumeably a PzIVf2s)of the 24th Panzer Division became a focal point of defence in the final days of Stalingrad. Until it was immobilised this tank had been used by one of the 24th Division�s regimental commanders, and it was linked by field telephone to Divisional HQ. But it could never move nor be moved. However the armour was sound, the turret could be closed, and the interior offered a modicum of comfort as well as security to five panzergrenadiers as the German perimeter shrank. Taking cover inside the panzer they slammed the turret shut, as Russian troops sped past. Within an hour they found themselves 2km behind the Russian front, completely cut off and with little hope of rejoining the comrades. But there was some food in the tank; they found that both the tank�s gun and its machine gun worked, and there was plenty of ammunition for both. Moreover when one of the five picked up the field telephone and gave the handle a tentative turn, an operator at the divisional exchange answered him. "What are we supposed to do? ", the panzergrenadier asked. "Stay where you are", was the answer. NOTE: In this article a Tiger Tank is mentioned and also a 75mm gun. 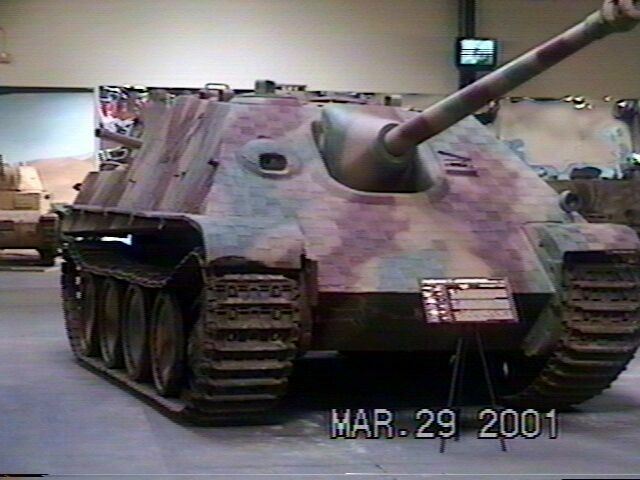 From a general consensus the tank in question is a Mark PzIVf2s. Thanks for all your input. In any battle, events are often turned by the actions of individuals, often out of all proportion to their contribution. A charismatic leader can either push his men to great achievements or his death or injury can send a chill through the whole operation. Even a lowly soldier can turn things around. There were many examples of this during the Canadian operations along the Adriatic Coast of Italy during the Autumn of 1944. The Canadian front stretched from the coast inland as part of the over-all Eighth Army responsibilities. The shore was carved deeply with irrigation ditches, creeks and rivers making it good defensive ground and lousy tank country. The land was rich black loam that readily sopped up the rain -- and blood -- that fell heavily during that fall. The Germans were dug in and ready. Here, 2,000 years before, Caesar had crossed the lost river, the Rubicon. Halfway through the 20th Century, Eighth Army was demanding the Canadian Corps continue to press the enemy and "get a bridgehead over the Savio" -- one of the many rivers in vicinity that locals claimed as being the Rubicon. The Princess Patricia Canadian Light Infantry were the first to test the Savio. On 20 October, two companies worked their way past the mines that were liberally sown on the steep muddy banks of the river and splashed across the waist-high Savio. But by 17:00 hours, both companies of Pats had been decimated by the heavy fire that greeted them. In D Company, one platoon and part of another huddled below the far bank, unable to move further. Meanwhile A company's Major Ted Cutbill counted heads and found that he had only 16 men. He also found his radio refused to work. After dark, out of touch with battalion HQ, having waited in vain for stragglers, and seeing no sign of D Company (the platoon and a half that had made it across had pulled back under cover of darkness), Cutbill led his men on a daring foray deep into enemy territory scouting out their positions. Cutbill then decided the best plan for his force would be to dig in along the riverbank's far side and send Sgt. F. H. Sparrow to fetch reinforcements. Cutbill's persistence maintained the hard won bridgehead and provided the Canadians with vital information important to exploitation, despite the size of his force. The Germans were aware of the presence of the small bridgehead formed by the pesky Pats and Saturday, 21 October, gave the unit a pounding with arty, followed by repeated localized counter-attacks. Sgt. Sparrow had returned with a radio and a handful of reinforcements, but with the company running low on food and water, he volunteered to make another trip back across the Savio. Sparrow survived the daylight venture (the previous one was done in darkness), fetching food and ammo and providing command with details of the German positions. On his return, he also told Cutbill of a coming attack by the Seaforth Highlanders and the Loyal Edmonton Regiment. Sparrow was later awarded the Military Medal for his bravery. It rained all day as Bogert's battalions prepared for the attack. Unlike the Pats, the Seaforths and the Loyal Eddies had time to recce the river area and knew what to expect when they attacked. And they had support in the form of two medium and six field regiments of arty, plus every mortar and machine gun in the Saskatoon Light Infantry (Savio marked the first time ever this regiment fought together as a unit). At 19:55 hours, the bombardment began and half an hour later two companies of Seaforths and third of Eddies crossed the Savio. The Seaforths attacked on either side of Cutbill's dug-in troops. Captain Don Duncan's D Company on the left crossed the Savio in single file and scrambled up the far bank where they contacted the Pats. Some of the Seaforths, finding their weapons clogged with mud, traded with Cutbill's men. At the same time, Captain Anthony Staples' B Company took advantage of the steady rain and darkness and speed and manoeuvre to clear the Germans from a number of machine gun nests in the area. By dawn, B Company alone had rounded up 51 prisoners. Meanwhile at the other end of the battle, the situation was less favorable. The Edmonton's commander was Major Bill Longhurst who had devised the "mouseholing technique" for street fighting while in Ortona. Although seriously ill he insisted on leading his troops, but died early in the attack, riddled with bullets on the muddy bank of the Savio. News of the commander's death caused a drop in morale and the attack in the Eddies sector petered out. Some of Longhurst's men were captured, others scattered, but company Sgt. Major W.G. Davies rounded up 10 survivors and dug in. As soon as Colonel Stone realized what had happened to his Regiment's company, he forwarded another across the river. This turning point allowed the Eddies to establish a firm bridgehead and during the night, both battalions sent across their reserves. Counter-attacks were not long in coming. As the Seaforth commander Budge Bell-Irving later said, "Getting there and staying there were two different problems." The river meant all the heavy support equipment had to be left behind and even after a bridgehead was established the soggy ground did not make for easy transport. Meanwhile German armor, supported by infantry, began pushing to drive the Canadians back across the Savio. Bell-Irving played his trump card, a newly created tank-hunting platoon of 16 soldiers equipped with four PIATs. While all battalions had tank-hunting platoons, they were typically defensive in nature. But Bell-Irving's men went looking for trouble. Their tactics were simple: Hawkins anti-tank grenades were used to immobilize the tank, which was then knocked out with a PIAT, and the crew finally dispatched with Tommy guns. At 2:30 hours, four Panther tanks, two self-propelled guns, and 30 infantry rumbled out of the gloom. The Seaforth tank-hunters were waiting for them. Sgt. K. P. Thompson carefully laid a string of Hawkins grenades across the road and deployed his two-man PIAT teams nearby. The first victim was a German staff car which missed the grenades but was riddled with bullets, killing the two occupants. A self-propelled gun followed, hitting a grenade; a PIAT finished it off. Private James Tennant fired his PIAT "at such close range that either a piece of shrapnel or the ring from the bomb flew back into his eye." Next came a Panther; Private Ernest Alvia Smith hurried out to meet it. A former track star from New Westminster B.C., the stocky 30 year-old Smith was nick-named Smoky because of his speed. The night's fighting earned him one of the highest military awards available, the Victoria Cross. Smith ran into a field with a PIAT team. He left a single man and a PIAT there and crossed the road with his injured friend Tennant to fetch another PIAT. The two Seaforths just got into position when the Panther approached, its machine guns raking the roadside ditches. Tennant was hit and Smith jumped into the road in clear view of the firing tank. At a range of 30 feet, he fired his PIAT at the Panther. Ten Germans riding on the back of the 50 ton tank leaped off and charged Smith, who picked up his machine gun and cut down four of the enemy, forcing the rest to flee. A second Panther and more infantry came at him, but Smith steadfastly stood over his wounded friend, calmly reloading his machine gun with magazines collected from the ditch. Time and again he drove back the enemy with hails of bullets. A third Panther came into action, this time forcing Smith to help Tennant to safety and medical aid. Smith then returned to his post to await further counter-attacks. He was the second New Westminster native to be awarded the VC. "I was scared the whole time," he later reported, "who wouldn't be?" The morning brought a host of surprises, including the discovery and capture of a bogged-down Panther in a nearby ditch. German machine gunners who were on the riverbank behind Bell-Irving's bridgehead came out of their posts in the morning for breakfast. Arriving where their kitchen had been with mess tins in hands, they were captured by the Canadians who had made the old German set up D Coy HQ. Amazingly, the Canadians caught 56 PWs in the line-up for chow. Another group were captured when the Canadians cut the communication telephone line down to the river; the Germans sent a repair crew who was promptly taken prisoner. Altogether, mopping up that morning was done without a shot fired and 150 Germans were sent to the Canadian rear. By 28 October, after more tough battles, the objective of Ronco was captured by the Canadians and other Allied troops. Just days later, however, the whole Italian campaign was "Dragooned" by the American plan to invade southern France. The loss of forces in Italy to this operation, coupled with the ongoing fighting in Northwest Europe took the edge off the forces in Italy. Although the Allies still had superior numbers, the loss of forces to the other fronts coupled with the lousy weather and the defensively oriented terrain meant future Italian operations would be seriously weakened. The Canadians for the most part were withdrawn and moved to another equally water-logged area. Although British military experts have scoffed at the story that the Russians attacked German tanks by using dogs with mines strapped to their backs. It is in fact true and is substantiated by the archives of the Stalingrad Defense Museum, and by German sources. �On the morning of 30 September the simultaneous battles of Viasma and Briansk Began with the roar of panzer cannon and anti-tank guns. The riflemen of the 1st Company, 3rd Rifle Regiment, cling like grapes to the troop carriers. Why walk While there is no shooting? And the troop carriers of the 1st Company can carry quite a number. Up front Leutnant Lohse is travelling in the command truck of the 1st Company. �Look for the dogs, Eikmeier� he orders his driver. �Dogs?� remarks the corporal. �Why watch out for dogs, Herr Leutnant?� Corporal Ostarek, the machine-gunner, also looks up surprised. �Dogs?� He says. The trucks are driving across a broad field. Russian machine-gun fire can be heard on the left, from advanced positions along the edge of the sprawling village. The 3.7 cm anti-tank guns open up. The riflemen of the 3rd Company have jumped off their carriers and advance on foot. Hand-grenades are being hurled into the wooden shacks. Near the church some well-camouflaged positions between the shacks come into view. Unteroffizer Dreger checks a party of Russians with his machine-gun. The dog is running at top speed. On his back ne carries a strange-looking saddle. Before Ostarek can bring his machine-gun into action, Captain Peschke has fired his rifle from the other side at 300 yards range. The dog leaps into the air and collapses, in a heap. Mine dogs! A new word has been coined on the spur of the moment and it will go down in history as a new highly debatable weapon of the Soviets. The dogs carried two linen saddlebags filled with explosives. An upright wooden stick, four inches long, acted as a mechanical fuse. The dogs had been trained to run under the tanks and as soon as the stick bent or broke the load on their backs exploded. Soviet war literature does not mention this diabolical weapon but there is little doubt that mine-dogs were tried out. Interrogation of the captured dog-leaders by the 3rd Panzer Division revealed that the Moscow Rifle Company was equipped with 108 dogs. They were trained with tractors. The dogs had to get their food from under the tractors while the engines were running. If they refused they went hungry. They were hungry when brought into action and ran under the tanks where they hoped to find food. Click here to return to the main page of "ROB'S PANTHER PAGE" or click on the banner to return to the main page! TO THE ADDRESS ABOVE, THANKS. 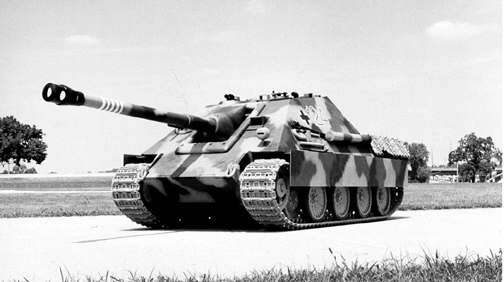 A PANTHER AUSF. 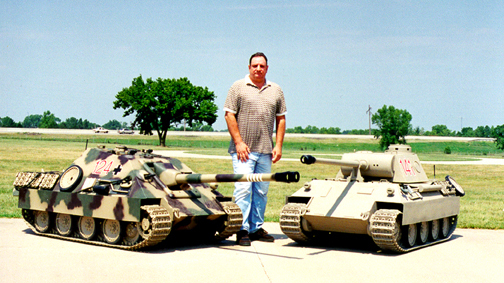 D AND A JAGDPANTHER COURTESY OF ANOTHER TANK & MODELLING ENTHUSIAST AND BUILDER D. SHULTZ PLUS A NEW PHOTO SHOWING HIS LATEST MODEL THE StuG III.